On the last track we discussed dealing with child grief. Regarding child grief, reestablishing security is one way to help children cope effectively. Four methods for reestablishing security are actively manage the level of change in the child’s life, actively increase the level of predictability in the child’s life, deal with any of the child’s health concerns, and increase the child’s feelings of control. On this track we will discuss therapeutic tools. Two effective therapeutic tools for helping children get in touch with their feelings are therapeutic play and feelings football. As you listen to this track, you might consider playing it during session with your client. One way clients can help children work through feelings is through one of the most basic tools in child development; therapeutic play. Depending upon the children’s ages and levels of understanding, play allows them to express and understand emotions such as fear and anger. They can test ideas, release tension, and heal emotional hurts. Play acting with medical equipment and dolls may encourage discussion of medical issues that children find too threatening or embarrassing to talk about when addressed directly. Dolls or puppets can be used to teach your children about operations, catheters, incisions, and other medical interventions. 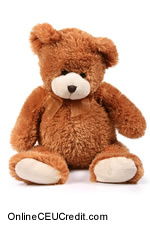 For young or anxious children, using a stuffed animal may feel less threatening or frightening than using a human figure. Mike, age 42, had taken custody of his sister’s children after she died from bone marrow cancer. Mike was having trouble helping the children adjust to the fact that their Aunt Sara had recently been diagnosed with lymphoma. I stated to Mike, "See if it feels right to offer to play a game of ‘chemo,’ ‘radiation,’ or ‘operation.’ Let the children choose which role they play. Or you may be more comfortable playing a game like ‘school’ or ‘house’ where concerns about abandonment, illness, death, disability, or love can be verbalized or acted out. Role playing offers one more window into how the children are doing. Playing with the kids can be some of the most productive work you can do. Mike stated, "Sara might play with the kids, but I don’t really have the imagination for it." How might you have responded to Mike? I stated, "Drawings are another tool to help you know what’s going on in the minds and hearts of your children. Suggest drawings by asking the children to draw pictures of things that make them sad, happy, or mad. Draw with them, but be general in what you ask for. Let the children lead. Without any training, you can use their drawings as a springboard for discussion by asking, ‘Tell me about your picture. What is the little boy doing?’"
Mike stated, "What if they draw stuff and I don’t know how to talk about it or what it means? Scotty is 13 and seems like he might be slightly disturbed." How might you have responded to Mike? I stated, "If discussion with the children about the art work is not reassuring, or if discussion is impossible, bring the drawings in to me. We can review and talk about them." So that Mike could help Scotty through his grief and get in touch with his feelings, I shared with Mike the "Feelings Football" concept. 1. First, Mike and Scotty began a game of catch with a football. 2. Second, each time Mike or Scotty threw the football, he had to name a feeling that someone might feel if a person they loved had cancer. Because Scotty was stating feelings other kids might experience, he was able to express himself without any embarrassment. 3. In addition to begin a game of catch and name a feeling, the third step in the "Feelings Football" technique is to regulate the pass based on the intensity of the emotion. For example, Mike stated, "Scotty shouted "sad" and threw that football high into the air. I said "jealous" and threw the ball pretty low to the ground." Because Scotty already enjoyed football, it was easy for Mike to integrate emotional coaching using football. If the child of your client enjoys other activities, recreate the "Feelings Football" technique around that activity. For example, another client of a grieving child I treated stated that her daughter enjoyed baking. The client and child made cookies together and used icing to create faces expressing various feelings. Can you think of a way to recreate this technique to help a child cope with grief? If you have found the information on this track applicable to a client you are treating, consider playing this track or parts of it in your next session. On this track we discussed therapeutic tools. Two effective therapeutic tools for helping children get in touch with their feelings are therapeutic play and feelings football. On the next track we will discuss regression and failure. What are two effective therapeutic tools for helping children get in touch with their feelings? To select and enter your answer go to CEU Answer Booklet.